Ahhh yes, freeze dried entrees. After a day of munching on granola bars and beef jerky on the trail, isn’t a hot meal so satisfying? That is, until it starts coming up in the middle of the night. As you’re kneeling in the dirt outside of your tent heaving up pad thai, certain questions may come to mind: How did I get here? When did I even eat carrots? Why are you doing this to me, Backpackers Pantry? Don’t despair, I have answers for you, and it wasn’t your freeze dried meal’s fault. 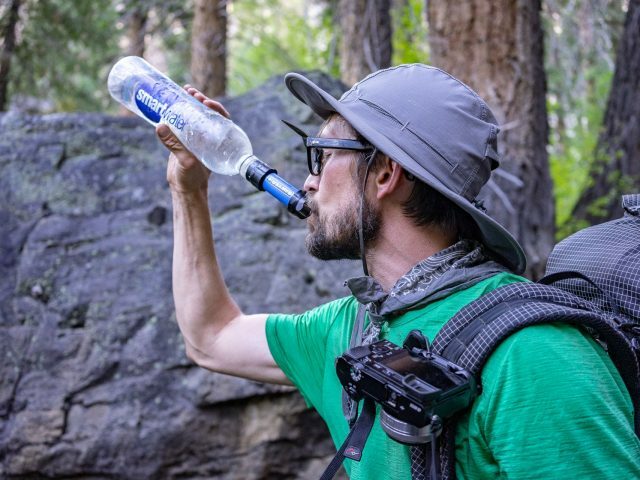 Diarrhea and vomiting may not be as fun and glamorous as gaping wounds, but they killed more people than guns during the Civil War, and they are the most common ailment to affect backcountry adventurers, so I’ve taken special care on this First Aid Friday subject. Why is this ahead of water treatment? Because good hygiene has actually been shown to be a bigger factor in reducing GI illness than water treatment. Wash your hands after nature calls and before you eat. If possible, use bio-degradable soap and water, but if water is scarce you can use a hand sanitizer. Wash your dishes with soap and water or whatever you have available. (When backpacking, I use wet wipes and a little bit of water) Do not reheat leftovers that have been sitting out all night. The heat may kill bacteria, but the toxins that cause illness will still be present. Still important. Whether it’s Iodine, a water filtration pump, or boiling, you must treat ALL of the water you consume. After trying several different forms of water treatment, my favorite is just straining water through a nylon stocking and treating it with Aquatabs. Okay, so despite taking pains to avoid it, you’ve found yourself visiting the bush four times a night with the trekker’s trots or barfing up your chicken teriyaki. This is where a well-stocked portable pharmacy can help you recover. Dehydration and electrolyte loss are the greatest hazards associated with GI illness. This is where ORS tablets come in. Not only do they replace your valuable electrolytes, but you can get them in tasty flavors to make drinking a little easier. Drinking exclusively ORS water is unnecessary. Drink about one third ORS water to two thirds plain drinking water. If you are experiencing severe vomiting, take one sip of ORS water every 15 minutes. Don’t get frustrated if you can’t seem to keep it down. Increase or decrease the time between sips as the vomiting allows. Don’t put away your portable pharmacy yet. If you’ve stocked these staples, recovery will be a breeze. Bismuth subsalicylate has a variety of different benefits and should be used in both vomiting and diarrhea. Not only does it relieve GI upset, it actually kills the harmful microbes in your GI tract. The liquid formulation is more effective, but when weight is an issue, tablets can be used instead. Loperamide slows diarrhea. Take 4 mg after the first loose stool, and 2 mg for each following loose stool. Do not take more than 8 mg in a day. DO NOT take it if there is blood in the stool or if you have a fever over 100.4 degrees Fahrenheit. These can be highly effective in reducing mild to moderate nausea. I also stock ginger tea in my backpack. This little pink multi-tasker has so many uses beyond just treating allergies! It is also effective in controlling nausea and vomiting. It’s a mild sedative that can help you sleep, take the edge off of a backcountry panic attack, and can even be taken safely by dogs. Diarrhoea and Vomiting Caused by Gastroenteritis: Diagnosis, Assessment and Management in Children Younger than 5 Years.